It’s finally springtime and the perfect time of year for a garage sale! We’ve been gathering items around the house all winter long and this Saturday we are finally having a garage sale! We’ve been stacking things up for months in preparation for the big day and I think we’ve finally sorted through enough to have a pretty decent sale! Besides going through the house to find “treasures” we want to sell, I’ve also been making a to-do list of tasks leading up to the big sale. Here are a few tips in preparation for selling and making money at your next garage sale! Good signage – Make it easy for buyers to find you! Use arrows and big letters, your sign doesn’t need to be fancy – just easy to read! Don’t put signs out the night before, if you do they’ll either be gone or damp in the morning. Wake up extra early and get those signs in place. The more, the merrier – Ask other families to join your garage sale! A multi-family sale means more items and more potential customers. Besides, it’s fun to have others celebrate a big sale with you! My brother-in-law and his family are teaming up with us for our garage sale! We should have a lot of great merchandise! Be ready to make change – It’s something most people forget, but it’s probably the most important thing! Make sure you’ve got plenty of small bills and coins to keep you from running to the bank at the last minute! Without proper change, you could lose a sale! Be flexible, yet reasonable – Set pricing (and label everything) before your sale, but be ready to drop the prices if necessary. More than likely, buyers are going to try and negotiate. If you really want to get rid of things and make money – be willing and flexible to accept less than the sticker price. Delegate! – Everyone should have a “job” at the garage sale. Designate someone to the be the cashier, another to be the salesperson and another to keep things running smoothly behind the scenes. Organization and good customer service are key! Clean Up Plan – At the end of the long day, the last thing you want to do is decide what to do with the leftovers. Have a plan in place before the day even begins. Decide in advanced whether to donate items, place them on the curb or use Freecycle to get rid of the things that didn’t sell. Whatever you do…don’t bring them back in the house! I’ll update you next week on the results of Saturday’s sale! 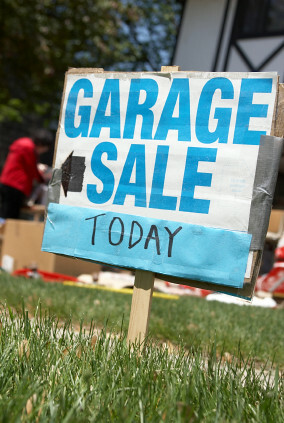 For now, what tips do you have for hosting a garage sale? What worked for you (and what didn’t)?! Sales with nothing labeled annoys me too! The owner is just making more work for themselves by having to answer so many questions about prices – labels solves everything! Great tips! I can’t tell you how many times someone has handed me a $20 at our garage sales. I never thought to put a listing on Craig’s List, so thanks for that one! Thanks, Mary! It’s amazing to check out the garage sale listing on Craigslist – there are tons! Your tips couldn’t have been more timely! We are having one in May. This year we are going to try and have several homes on the block participate – hopefully that will draw more people. We also collectively pay for an ad in the local papers. Yay! So glad these tips were helpful for you! Keep me posted on how it goes in May! These are great tips! You’re inspiring me to have one next month! We had one last year and it was great! We also had a cooler full of bottled water and cans of soda that we sold. We also made sure to save lots of plastic bags from grocery shopping (or get some from a retailer, ahem!) so we could bag items for people if needed! Oh …great idea about the shopping bags! I’m going to add that to my to-do list! I’m so glad these tips were helpful for you! Maybe after this weekend, I’ll update it with more tips of thing I could improve on for next time! Great tips. I have a few more to share if anyone is intersted. I am still debating whether or not I am going to have a yard sale this summer. I don’t like the set up or the clean up! I guess it goes with the territory. Hi Amy – Thanks for the great tips! Setup and clean up are definitely no fun, but worth it when you count up the money earned!